If you have bad breath, don’t just ignore it or try to cover it up – in some cases, it can be the sign of a serious medical condition. Keep reading to learn which diseases can be indicated by bad breath and how a knowledgeable dentist can help you address them. Bad breath is technically known as halitosis. Since the tongue has an uneven surface with millions of places for bacteria to hide, it’s also a wonderful place for odors to develop that can lead to bad breath. You can easily fix minor cases of bad breath with better dental hygiene. Regular brushing, including brushing your tongue in different directions and flossing, can remove the bacteria that cause bad breath. Drinking lots of water will also keep your mouth cleaner and fresher. However, if you still have bad breath after making changes to your dental care routine, it’s time to see a dentist to learn if there’s a deeper issue going on. Poor dental hygiene can lead to bad breath and many other problems. When you fail to brush and floss your teeth and/or dentures every day, your tongue and teeth can become coated with plaque. The bacteria that cause plaque can produce unpleasant odors, as well as leading to tooth and bone loss. It’s essential to see your dentist if your gums are red, bleeding, or pulling away from your teeth. Those who smoke or use smokeless tobacco often have bad breath, because nicotine persists in the mouth and causes odors. It goes beyond that, though. These individuals are more likely to develop gum disease, which can lead to tooth loss. They are also in a higher risk group for oral cancers. If you have bad breath related to tobacco use, it’s important to keep regular dental checkups to rule out serious oral health concerns. Make an appointment today if you haven’t been seen by a dentist in the past six months. 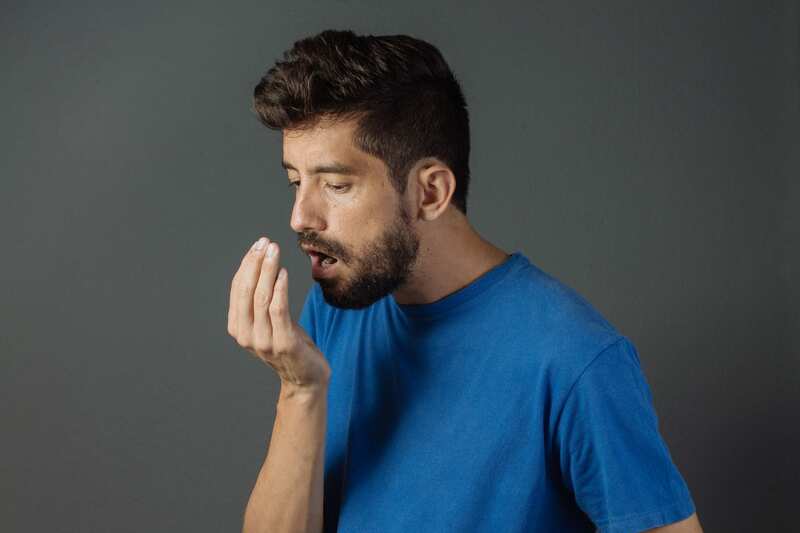 Dry mouth is a side effect related to many medications. Unfortunately, it saps the saliva from your mouth, which can create unpleasant odors. It is also an indication that your salivary glands aren’t functioning properly, and it may indicate other serious diseases. Left untreated, dry mouth can cause you to lose your teeth. Check with your dentist to determine the underlying causes of dry mouth. You can also receive treatments for dry mouth through your dentist, which will help improve your bad breath. If you have had recent oral surgery that isn’t healing properly, an infection may be developing that is causing bad breath. If you have a swollen or painful incision area, check with your dentist right away. You may also have a mouth sore that has become infected. Your dentist can treat the sore with medication or antibiotics to eliminate the infection. Other causes of mouth infections include dying teeth and gum disease. A dental checkup is needed to correct these conditions and improve your bad breath. If you have inflammation in your tonsils, it can lead to bad breath. Chronic inflammation of your sinus passages can produce post-nasal drip, which has odors that show up as bad breath. See your dentist to determine if a throat or sinus problem is the cause of your bad breath. If you have gastroesophageal reflux disease or GERD, your breath can be negatively affected by a consistent reflux of stomach acids. This disease can seriously damage the lining of your esophagus and stomach and interfere with proper nutrient absorption. See your dentist or doctor if you suspect you have this disease. In rare cases, bad breath can be a sign of some cancers or metabolic disorders. These diseases produce certain chemical reactions that lead to bad breath, often indicated by a metallic flavor or scent. Bad breath can also signal serious health concerns such as diabetes, hormone deficiencies, lung problems, or kidney failure. A visit to your dentist will help you know if you need further testing for other diseases. First, check with a close friend or relative who is willing to give you honest feedback. If they say that you have chronic bad breath, first try to improve your dental care habits. If your breath quality hasn’t improved after a week of using different habits, make a dental appointment to determine the cause and receive treatment. Don’t hesitate to get help through your dentist so that you can receive treatment for other health problems as needed.